Kevin Bishop has a varied career as a violist, violinist, conductor, composer, educator, and arts administrator. He has been referred to as “an enthusiastic young violist” by Chamber Music Magazine and a “brilliant young entrepreneur” by Classical KUSC FM Los Angeles. WNPR's Steve Metcalf wrote that Kevin "has established himself as one of the region’s most enterprising musical figures." Speaking of a solo viola performance on a Toccata Classics/NAXOS album, Fanfare Magazine said "Allah Hu... is a lovely, yearning piece, played with great intensity by Kevin Bishop". As an international competition winner on viola, Kevin played recitals at Carnegie Hall and Lincoln Center. He has performed, conducted, and taught masterclasses in Bolivia, Brazil, Columbia, England, Germany, Switzerland, the Netherlands, Afghanistan, Turkey, and the USA. He has been guest lecturer at the New England Conservatory in Boston, the Institute for Cultural Diplomacy in Berlin, Germany, and at the Chamber Music America national conference. He has played viola in everything from the complete chamber music of Brahms with the Southern California Brahms Festival to on stage with the Foo Fighters at the Grammy Awards and with members of Led Zepplin. He has appeared on NPR’s Morning Edition and All Things Considered, BBC Radio 3, and countless local stations in the USA, South America, Afghanistan, and Europe. He can be heard - as a viola soloist, chamber musician, and composer- on the album “The Rosegarden of Light” released by Toccata Classics and Naxos. He has a new album being released in 2018, with Cuatro Puntos on Divine Arts Records, featuring several of his compositions. Furthermore, he has spent 13 years arranging and performing pop music with the Golden Scroll Soloists String Quartet. Kevin’s primary interest is in the power of music education to aid in community building, personal elevation, and reconstruction. After spending three summers as a volunteer teacher and teacher-trainer at a rural El Sistema program in Bolivia, Kevin dedicated many years to the Afghanistan National Institute of Music in Kabul. He was a guest teacher and teacher-trainer for three summers, and then spent a year as the full-time Director of Orchestral Studies, Strings, and Composition. He led the country’s only orchestra and oversaw their revolutionary all-female ensemble. Kevin coached the country's first two female conductors as they led the Afghan Women's Orchestra "Zohra" in a performance at the World Economic Forum in Switzerland, which was attended by world leaders and watched across the globe. He led the orchestra in sold-out performances in Zurich, Geneva, and Berlin. Within Afghanistan he conducted the co-ed Afghan Youth Symphony in performances for presidents, ambassadors, and the Under-Secretary General of the United Nations. Other conducting credits include three times as conductor of the CMEA Connecticut All-State Elementary Honor Orchestra and four summers as chamber orchestra conductor at Arizona’s Strings Del Rio Festival. He also designed and led the first music enrichment for the BELL ‘Building Educated Leaders for Life’ summer program in Providence, RI, serving children ages 8-10 who had been held back in school. Kevin is Executive Director of Cuatro Puntos, a non profit organization dedicated to intercultural dialogue and universal access through the performance, writing, and teaching of music. Cuatro Puntos oversees a resident chamber music ensemble, concert series, and the Music Moves Hartford Street Choir for the those who face homelessness in Hartford, Connecticut. Before becoming director of Cuatro Puntos in 2012, he was Executive Director of the Western Society of Chamber Music in California from 2004-2011. 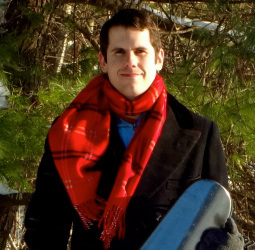 Kevin holds a Bachelor of Music degree from the University of California, a Master of Music degree from the University of Hartford’s Hartt School of Music, and a Certificate in Cultural Diplomacy from the Institute for Cultural Diplomacy in Germany. He received further training on viola at the Music Academy of the West and the Meadowmount School of Music. His primary viola teachers have been Helen Callus, Donald McInnes, Patricia McCarty, Steve Larson, and Linda Kline-Lamar. Read an article about Kevin and Cuatro Puntos on NPR. Read about Kevin and the Afghanistan National Institute of Music.